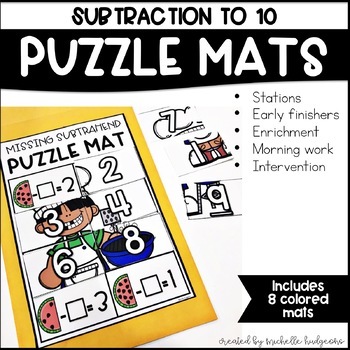 These SUBTRACTION TO 10 Puzzle Mats are a fun, interactive, and low prep way to reinforce number sense skills all while putting a puzzle together! How many Puzzle Mats are included in this resource? Puzzle Mats are just that - a puzzle! Students build a puzzle by placing the matching number on top of the matching picture. The goal for this activity is to identify the correct number and picture match to reveal the mystery puzzle picture. How to set up Puzzle Mats? 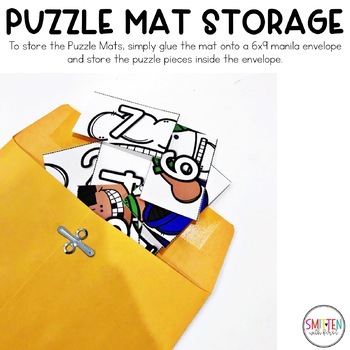 Glue the Puzzle Mat onto a 6x9 manila envelope and store the puzzle pieces inside the envelope. Store the envelopes in a bucket or station area for students to easily access during stations, or in your small group area. 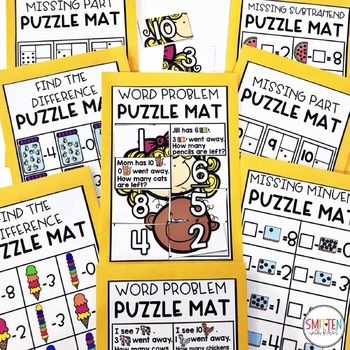 What other Puzzle Mats are available?